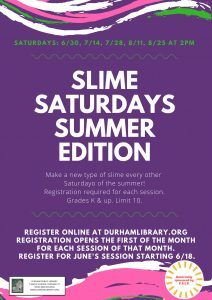 Make a new type of slime every other Saturday of the summer! Registration required for each session.Register online below. Grades K & up. Limit 10. Registration opens the first of the month for each session of that month. Register for June’s session starting 6/18.